"The J 20 certainly lives up to its “deluxe” inspiration, with outstanding tone and a host of nicely conceived features." "The story behind Jesse Hoff’s Lazy J Projects and how his modified tweed Deluxe from a pawn shop in Conley, South Carolina changed his life forever...."
"De J20 is een topversterker, echt iets bijzonders. Jesse heeft twintig jaar met liefde gesleuteld aan zijn verbeterde Deluxe en dat hoor je. Lazy J als merk is ook iets bijzonders en gaat naar mijn inschatting zo populair worden dat ik benieuwd ben of het klein kan blijven..."
"The J20 is a top-class product, Something really special. The fact that Jesse spent twenty years working on his improved DeLuxe can definitely be heard. 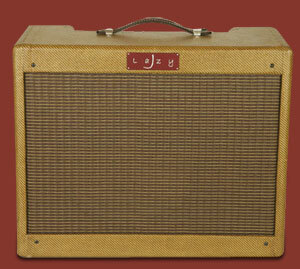 As a brand, Lazy J is something special too..."
Lazy J 20 wins the Guitar & Bass Guitar Award 2010 for best amp over £1000! "Lazy J hit the ground running. When we reviewed this update on the 5E3 tweed Deluxe, builder Jesse Hoff could already name Doyle Bramhall II and Pete Townshend as customers. Six months later Joe Walsh, Joe Bonamassa, Mike Campbell, Paul Weller and Noel Gallagher can be added to the list...."
Lazy J 20 wins the Guitar Buyer Best Amp of 2010 Award! 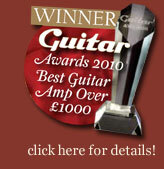 "Easily one of the best amps being made in the UK today. Over two decades, Jesse Hoff has corrected perceived inadequacies in the Tweed Deluxe design but at the same time ensured that none of his additions get in the way of the thing that matters most – tone. And on this amp, it’s nothing short of remarkable...."
"Complex harmonics blend with tight lows, thick mid range and a top end that is this amp’s crowning glory..."
"Despite the paucity of controls, this deceptively versatile amp can be pretty much anything you’d want it to be. It retains everything that’s great about vintage tweed Deluxes, but there’s no honky boxiness and it’s a clearer, louder and infinitely more usable amp for modern applications. This could be the ultimate 5E3-inspired combo – and I really can’t fault it." "Either we’re hallucinating, or Phil Harris has found something new that gets his juices flowing as much as a vintage classic..."
"The Model 20 demands you put a lot into every note, but if you do you'll be rewarded with staggering tone that ranks up there with some of the best small boutique amps we've ever plugged into...."
"Jesse Hoff hasn’t reinvented the wheel, but he has figured out how to make one that’s just about perfect. No wonder the big guns are buying them..."
"Jesse Hoff is no longer an underdog – with a client list that includes Beck, Bonamassa and Gilmour, you really can’t be – so he doesn’t need any favours from us. if the new 40 amp were a disappointment, we’d say so. it isn’t; it’s a successful combination of the sweetness and portability of the 20 with the room-shaking punch of the 80..."
deliver yet another truly stunning amplifier from Lazy J...."
"This amp is a good as it gets..."
"Sound is the noise your amp makes; feel is the way it responds to your playing; and tone is the confluence of these elements that puts a smile on your face and facilitates everything you try to do as a player. It seems that the best amp builders understand this, and Jesse Hoff is a case in point. 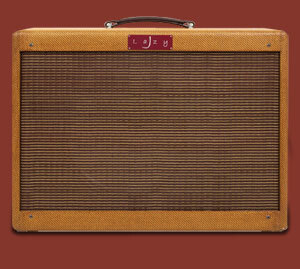 To us, the J 80 seems to combine the huge physical presence and wide frequency range of a high-power ’60s-era Fender with the dynamic feel and overdrive characteristics of a low-power ’50s-era tweed. Believe us, that’s a special combination." "The Model 80 delivers the full gamut of Tweed tone – clean and overdriven – but clarity is where this amp really excels. 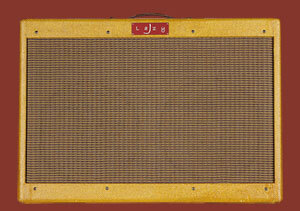 especially well suited for country pickers and pedal or lap steel users, it’s a big stage amp for professional players." "I actually tried both models at John Henry's in London. John said they were great. I went up to his pro-shop and had bash at it. I really liked them. The 20 was warm and had a refined Neil Young type of vibe and the 80 was like you would want a good tweed twin to sound like. What impressed me more than anything was the fact the amps were not too bright. Most of the time all I do is dump treble on those type of things. The amps will go plenty bright but not overly and remain solid when turned up to 11. I really liked them honestly." "It’s an ultra-sweet and totally organic-sounding overdrive, very much in the tradition of the legendary Klon Centaur – and if Hoff stops making these things tomorrow they could end up being worshipped in the same way." 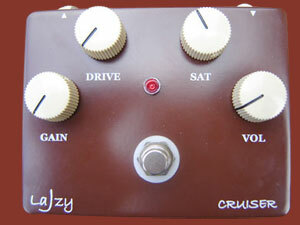 "The cruiser is a deliciously addictive pedal which delivers on all counts. If you like having everything from massive cleans through to filthy fuzz all in one pedal, then you’ll love it..."
"The pedal is completely unique, sounds incredible and deserves nothing less than full marks. ..."